BOSTON – It is a deadly Game of Thrones, and on a recent summer’s night it had the same hold on its audience as the hit HBO series. “Richard III,” the Commonwealth Shakespeare Company’s annual production on the Boston Common, takes place in the aftermath of the the English civil war known as “The War of the Roses,” the showdown between the House of Lancaster, symbolized by the red rose, and the House of York, with its white flower. 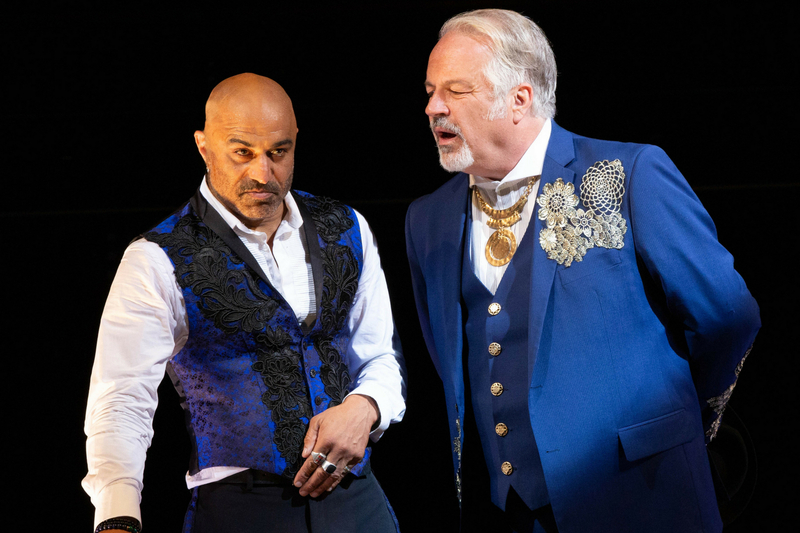 It tells the story of Richard, Duke of Gloucester (Faran Tahir), who murders and scheme his way onto the throne of England, only to lose it in battle for want of a steed. The dominoes topple one by one, as he conspires to first murder his brother, Clarence (Remo Airaldi) and then King Edward IV (Richard Noble). Treason and treachery are in season but at this point, he is just getting warmed up. One by one, he eliminates all the other heirs, with considerable help from another nobleman, the Duke of Buckingham (Fred Sullivan Jr.). Tahir captures the stage from the first, famous words of The Bard’s piece – “Now is the winter of our discontent, Made glorious summer by this sun of York” – and never lets it go. His Richard is not a deformed hunchback as the role is often performed, but a vigorous man with an inconvenient ache or pain that flares up at times, causing him to be uncomfortable, but not greatly disabled. He is a bone-chillingly dangerous nobleman, ruthless and brutal in ordering the executions of all who stand between him and the crown. When performing outdoors, actors are often urged to “play big” because instead of projecting to the last row of the theater, you’re projecting – albeit with wireless mikes – all the way out To Tremont and Charles streets. That’s where veterans of the CSC summer productions come in, such as the aforementioned Fred Sullivan Jr.; it’s a pleasure when he is able to take leave from his duties in Rhode Island to make the trek up Route 95 to the Boston Common, and this time he is up to his eyeballs in treachery. But when Richard reneges on the riches he promises Buckingham, Buckingham changes sides, only to meet his end anyway. Mark Torres is Lord Hastings, the Lord Chamberlain, whose close relationship with King Edward IV proves too close for comfort. The performances by the three women at the heart of the story are simply sublime. As Queen Elizabeth, wife of the late Edward IV, Deb Martin’s inconsolable grief at the loss of her sons is felt by every parent – or non-parent – in the audience. The scene in which she confronts an unrepentant Richard after her sons’ murders is almost too painful to watch. Bobbie Steinbach as Queen Margaret, widow of Henry VI, commands the stage and delivers an epochal tirade against Richard as only she can. Libby McKnight, as Lady Anne, widow of Prince Edward, Henry VI’s son, is horrified – as are we – as a monstrous Richard interrupts her grieving for her husband to suggest she take up with the man who murdered him. Eric Southern’s set design is utilitarian, a two-level, large performing surface that allows for easy entrances and exits, and provides plenty of room for the climactic battle between the forces of Richard and the Earl of Richmond (Michael Underhill), and Angie Jepson’s fight direction should not go unnoticed. CSC Artistic Director Steven Maler directs with his usual keen eye for both casting and pacing and “Richard” moves at a breathless pace; when the body count starts to rise, you dare not look away for a second. This is a quite a fine production, indeed, well-cast, well-played, and for those being introduced to Shakespeare on stage for the first time, very accessible. If you do get lost, there’s both a synopsis and family tree in the program to help you sort things out. The Commonwealth Shakespeare Company production of William Shakespeare’s “Richard III.” Directed by Steven Maler. Set design and lighting design by Eric Southern. Sound design and original music by Nathan Leigh. Fight direction by Angie Jepson. Costume design by Jessica Pabst. Admission is free, but $20 donation is suggested Chair rentals available. On the Boston Common through Aug. 5. Commshakes.org.